/ How Do I Redeem an iTunes Code from my iPhone? How Do I Redeem an iTunes Code from my iPhone? I’m working with a software developer and she just sent me an iTunes Code so I can get a copy of her latest app without paying for it. Nice, but how do you do that on an iPhone?? 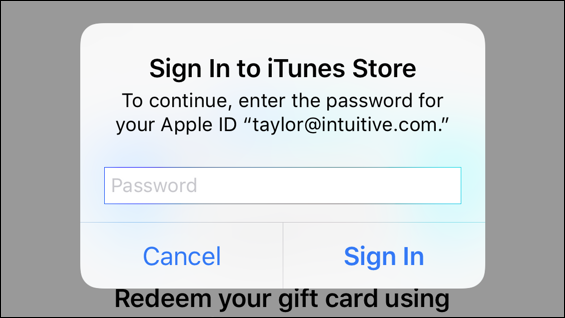 iPhone, iPad and even MacOS X developers can generate and share gift codes from the App Store to make it easy for friends, reviewers and potential clients to get a copy of your app without paying. If your app is free with in-app purchases, that’s another story, but even with a completely free app, sharing codes also ensures that they get the exact app you want. That’s particularly useful if you’re one of, say, twenty poker games for the iPhone! Turns out that redeeming these codes is identical to the process you’d use to redeem a physical iTunes Gift Card on your iPhone too. Handy, really. But the redeem button is pretty hidden so you have to know where to look or you’ll just be frustrated and baffled. Not good. I encountered this very situation when the developers of the 360 VR app DMD Panorama asked me to use their program to check out some virtual reality imagery. They just sent a code and it was up to me to figure out what to do with it. Handy to know that’s where you can redeem App Store & iTunes gift cards, but… that’s not what you have. Take your time and be careful, these codes are pretty baffling and definitely not readable. Remember your password? Good! Enter it, tap on “Sign In”, and you’re done. That’s it. Done. Installed. Ready to go. Just tap “OPEN” to proceed. And that’s all there is. Pro Tip: I have a ton of iPhone and iOS 12 help here on the site. Please take a few minutes to check it out!